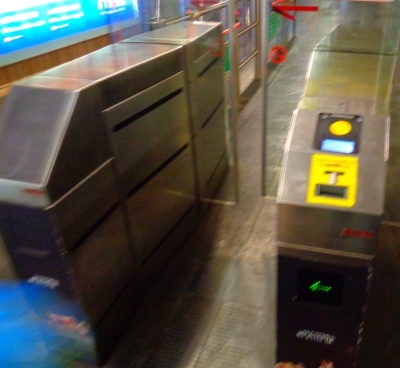 The metro of Rome: lines, tickets and ticket vending machines. 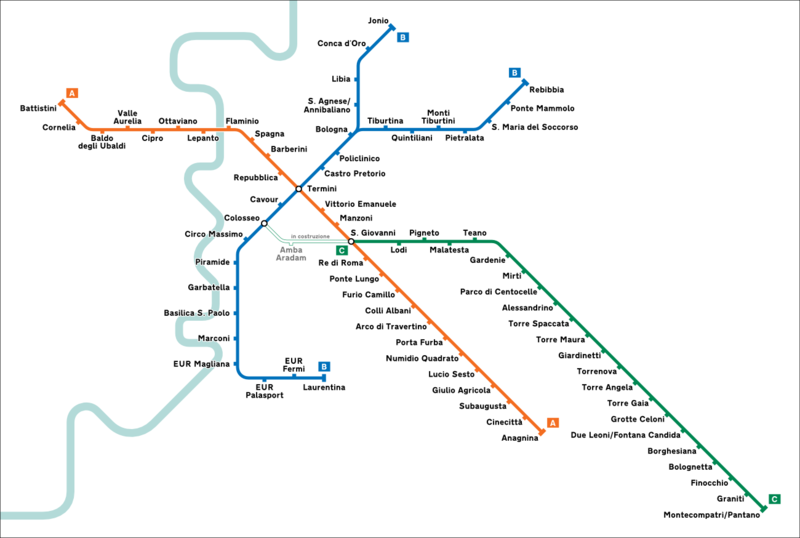 Rome’s subway network (metro) consists of only three lines. Until a few years ago there were only 2 lines. These two lines cross at Rome Central Station called „Statione Termini“. Tourists use line A the most. As in many countries, the subway in Rome is called Metro. The less frequently used official name of the means of local transport is Metropolitana di Roma. Although the network consists of only 3 lines, there are 74 subway stations in Rome. Most (exactly 59) are underground tunnel stations. You can recognize a subway station in Rome by this sign: A white M (for Metro) on a red background. Line C is currently (early 2017) not yet fully completed. 21 stations are in operation. However, the most important stations in the city centre are still missing. However, it has recently been possible to change from metro line C to the other two subways (as of January 2019). Since spring 2018 it is possible to change from line C to line A at the station San Giovanni. In a few years, the Romans and tourists will also be able to change from line C to line B at Colosseo. Almost all very important sights are on line A. At the stop „Barberini“ in the city centre is the famous fountain Fontana di Trevi, one stop further (name Spagaa) is the Spanish Steps. The metro station „Ottoviano San Pietro“ is near the Vatican. The Colosseum is, however, on line B (the station is simply called Colosseo). The following is an overview of the individual tickets in Rome. First, an enlargement of the screen of a ticket machine in the Rome metro. The picture shows the tickets in Italian. The machine can also be switched to German. Who buys the tickets in a shop is usually not understood in German. English, however, has become quite common in Rome in the meantime. All tickets are only valid in the area to the city of Rome and are not tickets to the airport Rome. Single ticket (biglietto 100 minuti, in the picture at the top right): A single ticket is cheap in Rome (1,50 Euro). This single ticket is valid for 100 minutes. You can use it to travel by subway, tram and bus. The only restriction is that you can only travel once in the metro, i.e. not round trip. Changing from subway A to subway B or vice versa is possible at the main station „Statione Termini“, as you can change without leaving the metro system. Day ticket (24 hours), 2-day ticket (48 hours) and 3-day ticket (72 hours): These tickets cost 7 euros, 12.50 euros or 18 euros. One advantage is that you only have to buy a ticket once in Rome and then don’t have to worry about it for the period of validity. All tickets are valid for all buses, trams and the metro within the city of Rome. Whether it is worth it is another question. For a 24-hour ticket, you must make at least 5 journeys to make the ticket cheaper than a single ticket. I usually buy 5 or 10 single tickets in stock and less often day tickets. Weekly ticket (biglietto settimanale CIS): Those who stay longer in the „Eternal City“ can also buy a cheap ticket for one week for public transport in Rome. It costs 24 euros. As far as we know, you have to enter your first name, surname and date of birth in this ticket, otherwise the weekly ticket is not valid. There are also monthly tickets available, but not at the vending machine. 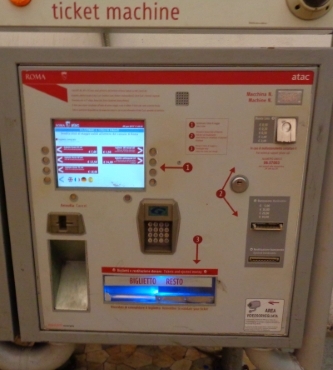 For this you should contact an ATAC service centre, which is the operator of the subway. Children under 10 years of age travel free of charge, older children pay the full fare. Of course, you still have to validate the tickets after purchase. There are devices for this in buses and trams. If you can’t cope with it, just ask another passenger or the driver. In the subway there is a barrier (see picture). You push the ticket into a slot and the door opens. Fare evasion is not a good idea in Rome. Controls are frequent, penalties are high. Excuses usually don’t help. By the way, all tickets are valid in the whole city of Rome and it is quite big. You can take the S-Bahn 30 kilometres to Ostia, where the famous excavation Ostia Antica is located. Everything from 1,50 Euro with a single ticket for 100 minutes or with the different time tickets.